JERSEY CITY, NJ – With dozens of proud family members in attendance along with Hudson County Sheriff Frank X. Schillari and local elected leaders looking on, the Hudson County Sheriff’s Office officially swore in 14 new Sheriff’s Officers at a ceremony today held at the Hudson County Administration Building in Jersey City, NJ. The new hires have all completed training at the Morris County Police Academy and will graduate on Thursday, joining the force within the upcoming days. 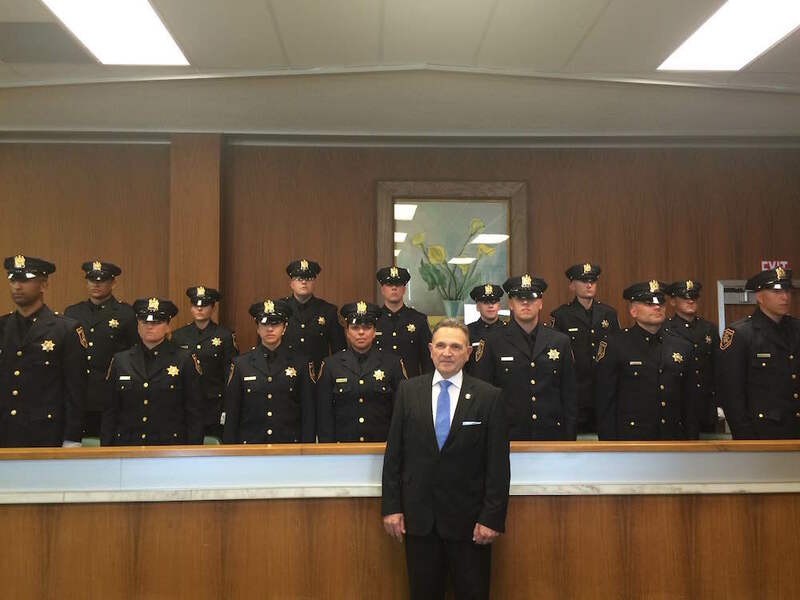 The new Sheriff’s Officers are: Andew J. Conti Jr., Claudio Negron, Brandon Z. O’Boyle, Jennise L. Sarmiento, Emily A. Ramirez, Kristen A. Bronowich, Jeffrey A. Vega, Andres N. Belmonte, Gary R. Nahrwold, Jason A. Arnone, Timothy J. Ballance, Brian D. Vitali, Yadira Alfonso and Mohamed M. Elnaggar. In addition to Sheriff Schillari, elected officials at the ceremony included Hudson County Freeholders Anthony Vainieri and Anthony Romano, along with Dignitaries Undersheriffs Andrew Conti and Bruce Lamparello among others.